Dinosaur Songs – now in English! As some of you already know, Orphan Songs has been on hold for some time as I have been working on other, quite different projects. I released a children’s album in Swedish in October 2012. It’s been rather successful and it’s finding new listeners every day. I also do musical adventure shows for kids locally. It’s great fun and very fulfilling work. I have also been doing tribute nights about Neil Young, one of my heroes. It’s not just an ordinary tribute night though. It’s a two hour tour through Neil’s life and career – from his childhood up until now. I talk and show slides as much as I play music. The show has been a great success and has given me a good start after I made the decision to create a new life for myself that would be centered around music making. But back to my kids project. The album I released was all about dinosaurs. I wrote it in Swedish as the songs were initially written for my son Svante. The album was recorded and released. I was very satisfied with the result and I thought it would be such a waste if I didn’t do and adaptation into English. It wasn’t easy though. I do have a masters degree in translation from the University of Lund, but that didn’t help me much. It’s a very unique process translating songs. It can’t sound translated. It must feel genuine. It took me some time but I’m really happy with the result. It’s just as good as the Swedish album. Some say it’s even better. So here it is folks! 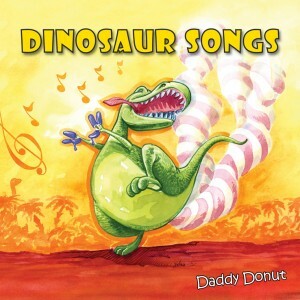 My first children’s album in English: DINOSAUR SONGS! My English alter ego is called Daddy Donut and he’s got his own website and Youtube channel. The dinosaur album is not CC licensed. But the album is available for download and streaming almost everywhere online. Itunes, Amazon, Spotify, Youtube, you name it! Enjoy! The whole album in 5 minutes! This entry was posted in Albums, Songs, Songwriting and tagged Kids on September 5, 2013 by Carl-Otto. Keep up the great work! You already know, many people are hunting around for this info, you could help them greatly.